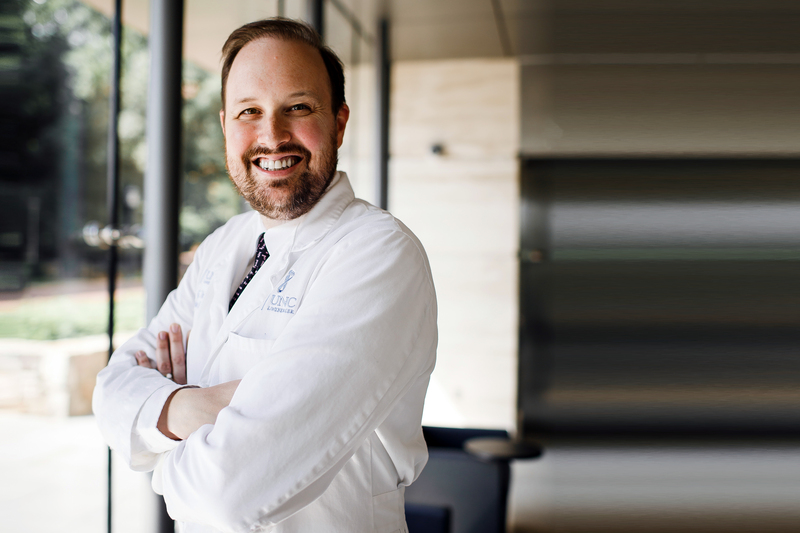 UNC Lineberger researchers led by Benjamin Vincent, MD, reported preliminary findings at the 59th American Society for Hematology Annual Meeting in Atlanta that are an early step in the overall plan to use the software’s predictions to develop immune-based therapies for leukemia. UNC Lineberger’s Benjamin Vincent, MD, is an assistant professor in the UNC School of Medicine Division of Hematology/Oncology. University of North Carolina Lineberger Comprehensive Cancer Center scientists have developed a software program that can accurately predict which tumor-specific markers will show up on the surface of leukemia cells in patients who have received stem cell transplants. Researchers plan to use their findings to develop immune-based therapies that target these antigens in leukemia patients. The researchers reported at the 59th American Society for Hematology Annual Meeting in Atlanta on Saturday, Dec. 9, that they were able to validate their approach for predicting markers –called minor histocompatibility antigens – in a group of patients with blood cancers. The preliminary findings are an early step in the overall plan to use the software’s predictions to develop immune-based therapies for leukemia. Cancer is known as a genetic disease in which errors in DNA help to drive abnormal cell growth. When mutations or other genetic changes occur, sometimes the cell’s machinery will read and translate those errors into abnormal proteins unique to cancer cells. This is one source of possible targets for the immune response in leukemia patients. In the context of stem cell transplant, genetic differences between the stem cell donor and the patient can also provide immune targets. The researchers hypothesized they could sequence cancer cells’ versus normal cells’ DNA and RNA to identify these targets, a process that required the development of custom bioinformatics software in the Vincent lab. In a retrospective study, the researchers tested whether their software could predict antigenic targets in a group of 101 patients with blood cancer who had undergone an allogenic stem cell transplant, which is a transplant using donor stem cells. They identified 16 known minor histocompatibility antigens. In addition, they predicted more than 100 new antigen targets. Looking ahead, researchers want to use their software to develop several types of treatments that target these predicted antigens. In one proposal, their goal is to improve stem cell transplants, which is the best chance of cure for many patients with high-risk blood cancer. Vincent said they could potentially use their predictions to engineer donor immune cells to specifically target the cancer cell antigens while preventing graft-versus-host disease, in which the immune cells attack healthy tissues. In addition to Vincent, the other authors are Jennifer L. Lansford; Udara Dharmasiri; Shengjie Chai; Sally A. Hunsucker; Dante S. Bortone; James E. Keating; Ian M. Schlup; Gary L. Glish; Edward J. Collins; Gheath Alatrash; Jeffrey J. Molldrem; and Paul M. Armistead. This study was supported in part by the University Cancer Research Fund and the Scott Neil Schwirk Fellowship.